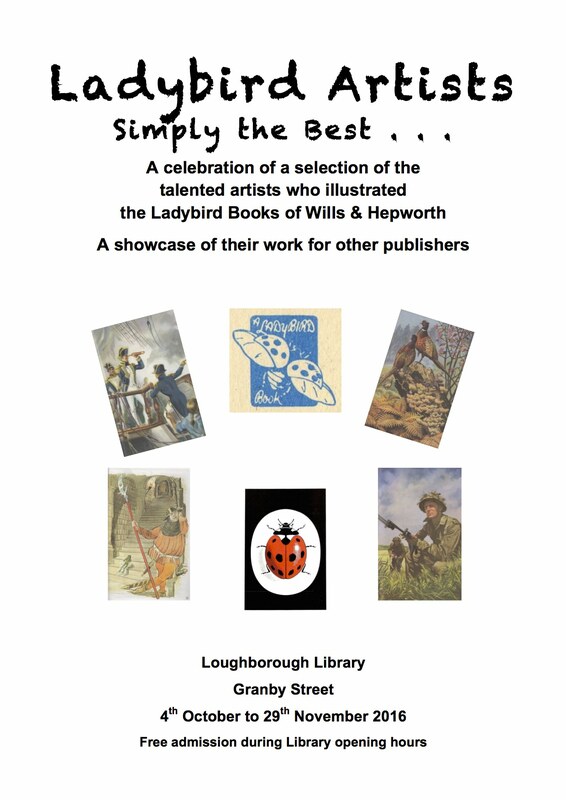 Last week saw the opening of a new exhibition by Local Studies Volunteers at Loughborough Library, which celebrates the work of many artists commissioned by Ladybird Books during their years based in the town. The internationally renowned children’s book imprint was created in 1915 by Wills & Hepworth, a publishing and printing company with premises in Loughborough’s Market Place. Restricted by paper shortages in the First World War, they designed their small, innovative books to be printed on a single large sheet of paper. Illustrations were commissioned from artists around the country and reproduced for printing by a team of artists employed by the company itself. Wills & Hepworth began trading solely as Ladybird Books in 1971 and was acquired by Penguin in 1999. 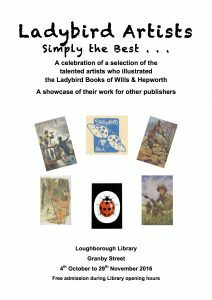 You can read here about a talk on illustrating Ladybird Books given at the first Loogabarooga Festival in 2015, which commemorated the company’s link with the town. Find out more about the history of Ladybird Books here. The exhibition is on display until the 29th November and is free to view during regular Library opening hours.